On 28 June, Ambassador Liu Xiaoming discussed the South China Sea issue with scholars of Royal Institute of International Affairs (known as Chatham House). Director Robin Niblett and heads and fellows of Asia and US Programs attended the discussion. Ambassador Liu expounded in depth and detail on issues concerning the history of South China Sea, China's policy and position, and the arbitration initiated by the Philippines. He also answered questions from participants about the freedom of navigation in the South China Sea, so-called militarization of the South China Sea, China's construction activities on part of the Nansha Islands, etc. Ambassador Liu spoke positively of Chatham House's significant contributions to promoting China-UK relations and academic exchanges between the two countries, and hoped that the Chatham House could continue to play a positive role in western academic circle and view the South China Sea issue in an objective light. Director Niblett and other academicians said that Ambassador Liu's detailed introduction and explanation on the South China Sea issue are helpful to western think tanks in getting comprehensive and objective understanding of the issue. 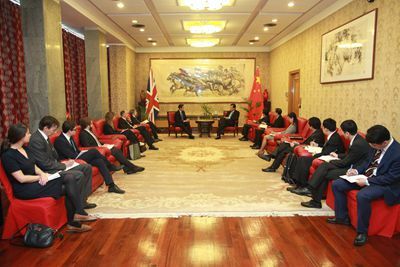 The Chatham House attaches great importance to the cooperation with China and is willing to further deepen the exchanges and collaboration. 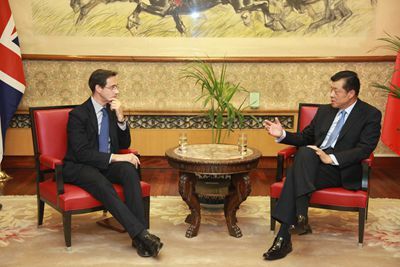 The two sides also exchanged views on China-UK relations, UK-EU relations and other topics. Founded in 1920, Chatham House is one of the most prestigious think tanks for international studies. With leading research teams and considerable reputation in the UK and the world, it has close contacts with the British government, businesses, media and academic circles, and significant influence on British foreign policies. Chatham House is committed to the study and research on international strategies, international relations and foreign policies, and regularly releases key publications such as International Affairs and The World Today.